Every page has its own story and its own set of page elements. Get them onto the canvas with 4 goals in mind. Each of these ends can be achieved in a variety of ways, all of which include getting your page elements (photos, journaling, title, and embellishments) onto the canvas using a knowledge of design principles and elements. There’s no one way to make every page. We talk a lot about scrapbook page design at Get It Scrapped. So much so that we came up with a big 12-lesson e-class called “Learn Scrapbook Design Principles.” Many of you have checked it out and told us how helpful it is for making well-designed scrapbook pages – and for understanding why a particular page design “clicks” while another may not. We’ve taught you about design principles you can remember with the mnemonic ECBARF for Emphasis, Contrast, Balance, Alignment, Repetition, and Flow. But what about other design elements that you know play a role in the designing of a scrapbook page: elements like line and space and color and texture? If you’re running through the E-C-B-A-R-F repertoire, just when do you work those other elements in? And what order should everything go in? And is one more important than another? While there are some rules for good design that you can apply to the “art” of making great looking scrapbook pages, this isn’t a science and the rules aren’t exact or precise. 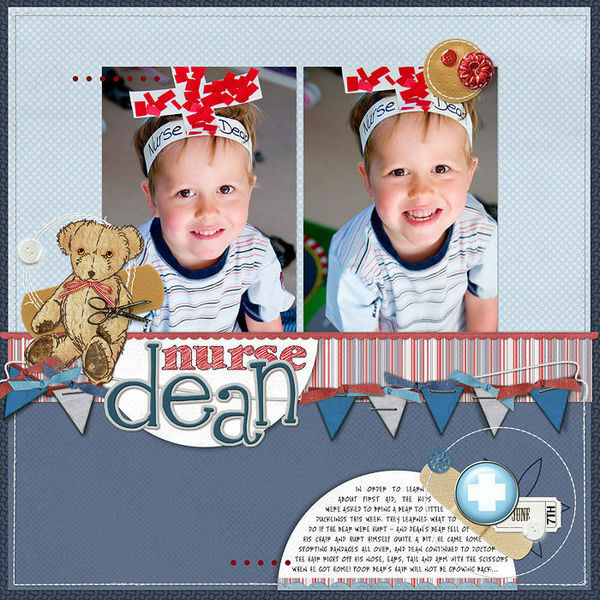 Think instead about the 4 things a successful scrapbook page does, and then employ design principles and elements that will let you achieve these things. Emphasis and contrast are the design principles to begin with when you’re vying for your viewer’s attention. It is the engaging photos, with Amber’s son looking right into the lens, that not only capture my eye on “Nurse Dean” but also draw me in to look at the complete story. Amber has emphasized them with their size, their cropping, their placement, and their strong contrast with the background upon which they sit. Seen in combination with the title they make me want to know more and check out the rest of the page. “Nurse Dean” by Amber Ries. Included in the “Digi Inspired by Paper” section of the Smorgasbord issue of Masterful Scrapbook Design. 2. Control the eye’s movement. Once you’ve captured the eye, you need provide a guided tour through the page so that the viewer understands the story in the way you’d like it understood. Repetitions, Contrast, and Alignments will all help you build Flow on the page. The starting place on “Jumping the Gun” is the closer-in shot of my son looking into the camera. It’s not just the cropping that makes it a starting point: it’s also the placement on the left side of a horizontal strip, and the embellishment and title accenting it. From there, the eye moves across the page toward the next spot of bright yellow, taking in the next photo, the title, and then the final photo with bare feet on snow. At that point, the viewer is ready to zoom in and read the bit of journaling on the small label. “Jumping the Gun” by Debbie Hodge. Making scrapbook pages is all about leaving a record and telling stories. Your choice of photos, title, embellishments and the way in which you place them on the canvas should come together so that the viewer understands what’s being viewed and why it matters. Lisa Dickinson uses every page element to tell the viewer what this page is about. With her emphasis on the photos of a mom with baby and then the title “She makes it look easy” we’re already understanding this is about a mom’s care of her child. Add in the joyful colors and embellishments and we’re guessing this care is happy and loving. The journaling tells us even more and we leave this page with a deeper understanding of the relationship of mom to child. “She Makes it Look Easy” by Lisa Dickinson. Included in the Design Play issue of Masterful Scrapbook Design. The title on “Finding Your Way . . . These Days” along with the larger photo of several people looking at their phones next to a street sign immediately cues the viewer that this is a story about getting somewhere. The eye begins at top left with the rhinstone and chipboard embellishment above the larger section of the title—and then over to the rest of the title, which tells you that this is not only about getting somewhere, but about the role technology plays in this effort. The journaling elaborates, revealing that technology isn’t always all it’s cracked up to be. Alignments and organizing white space make the presentation of multiple photos and journaling bits along with a longish title accessible to the viewer. “Finding Your Way” by Debbie Hodge. Why do we tell stories, create art, make scrapbook pages? The best records leave the viewer feeling something. Dina Wakley’s “Oh my!” with its exploding design, bright colors, and exclamatory title backing up photos of her son hamming it up for the camera sure makes me feel something: happy! “Oh My!” by Dina Wakley. Included in the “Style” section of the Smorgasbord issue of Masterful Scrapbook Design. The next time you make a page, stow your knowledge about design into your subconscious and bring these 4 goals to the forefront. Work to achieve them through the application of design principles to your particular page elements. How do you reach a point where design principles are second nature? At Masterful Scrapbook Design we’re delving into the processes of 5 guest designers every month, sharing their layouts and notes on them as well as interviewing them on these topics. In September, $12.50 lets you study with paper scrapbookers Emily Pitts, Lisa Dickinson, and Vivian Masket and digital scrapbookers Kayleigh Wiles, Debbie Hodge, and Amy Mallory. The topic is “design play” and you’ll see how top designers use a knowledge of design principles to challenge themselves and get compositions you’ll love.